Marantz AV8805 is brand’s first 13-channel AV pre-amplifier | What Hi-Fi? The multichannel AV processor/pre-amp supports Dolby Atmos and DTS:X, and can be used in a 9.1.4 or 7.1.6 configuration. Like many Marantz products before it, the AV8805 (which replaces the AV8002) is centered on Marantz’s Hyper Dynamic Amplifier Module (HDAM). 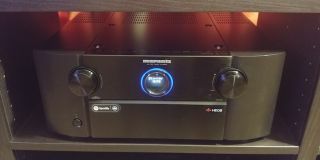 Naturally for an AV amp with as many channels as 13, it can decode multichannel surround sound formats like Dolby Atmos and DTS:X, with Auro-3D support coming via a future firmware update. Enhanced audio return channel (eARC) is also on the firmware update roadmap. The AK4490 32-bit DACs feed multiple digital inputs, which include twin optical and coaxial sockets, as well as eight HDMIs. All eight HDMI inputs meet the latest 2.0b specification, and are HDCP 2.2-compatible to allow 4K and HDR passthrough. A fine spread of 15 balanced XLR outputs and 15 RCA pre-outs make for a rather packed connections panel. There’s also wi-fi, Bluetooth, AirPlay and support for Spotify, Tidal, Amazon Music Unlimited and many more music streaming services, as well as a phono MM input catering for vinyl playback. The Marantz AV8805 will retail for $4500 and, in the US at least, starts shipping in February, a little after stablemate, the new Denon X8500H. UK pricing and release date is set to follow.